If you are looking for a thicker, creamer version of your regular yogurt, try Greek yogurt, which comes in flavors or in plain. It comes in the same flavors or plain, and you can eat it as a snack or incorporate it in recipes, desserts and smoothies. There are benefits to eating Greek yogurt, and comparing it to regular yogurt can help you choose which one is best for your dietary needs. This yogurt has many benefits along with a taste that will leave you feeling full and satisfied. Greek yogurt can have twice as much protein as regular yogurt. The extra protein will help you feel full and leave you feeling satisfied. Commercial Greek yogurts at supermarkets have almost double the protein content of standard yogurt brands. One cup of plain, low-fat conventional yogurt usually contains 5 to 10 grams of protein, where Greek yogurt averages about 13 to 20 grams of protein. Salt is a big red flag, and many consumers are looking for lower in salt items. According to the USDA, Greek yogurt has less sodium by up to 50 percent. Plus, it still has a full-bodied taste without the high sodium content. If you are watching your carbohydrate intake or have a sensitivity to carbohydrates like diabetes, then Greek yogurt is your ticket. Regular yogurts have 15 to 17 grams of carbohydrates per cup, where Greek yogurt averages around 9 grams. Because Greek yogurt contains less carbohydrates than regular yogurt, it has less lactose, the sugar in dairy products that can sometimes upset people’s stomachs. This is especially helpful for people who have lactose intolerance. 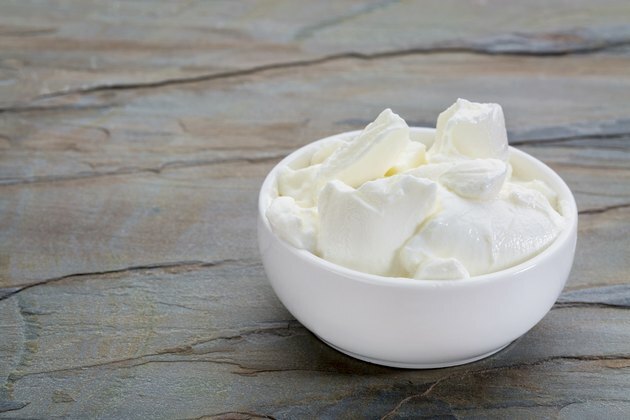 Greek yogurt can be used for many dishes including savory and sweet. Due to its thick texture and rich taste, many people use it as a substitute for milk, sour cream and even use it for baking. Greek yogurt has a smooth, rich and thick consistency. Part of what makes Greek yogurt different than regular yogurt is that it is strained to remove the whey. When whey is removed, so is water, which creates a thicker, more substantial yogurt product. This is why Greek yogurt is so popular because of the satisfaction after eating something creamy and smooth. Greek yogurt and other fermented foods, such as buttermilk and sauerkraut, contain probiotics, live microorganisms. These bacteria microbes may help improve digestive function and the immune system, and may also help reduce side effects of antibiotic treatments, explains the California Dairy Research Foundation. USDA: What's in Your Food? California Dairy Research Foundation: What Are Probiotics?